I really want someone to design a cookbook that enables you to use ALL of a particular ingredient before it goes bad. For example, if a recipe calls for 1 cup of chicken stock, but you can't find an 8-ounce carton of it, then along with that recipe would be a list of other recipes within that book that you could make later in the week to use your remaining chicken stock. At any rate, I'm glad my search brought me to this recipe. I love chicken piccata and hadn't made it in a while. As chicken piccata should, this dish had a nice lemon flavor, and the chicken stayed very moist. Sprinkle a small amount of water on a large sheet of plastic wrap. Place 2 of the breast halves on top of the plastic and sprinkle again with water. Cover with another sheet of plastic wrap and pound with a rolling pin or meat pounder until about ¼ inch thick. Repeat with the remaining 2 breast halves. Mix the flour with the salt and pepper in a shallow pie plate. Heat half the olive oil in a large skillet over medium-high heat until almost smoking. Working in 2 batches, place the chicken in the flour mixture and turn to coat on all sides. Shake off the excess flour and add to the skillet. Cook until lightly browned and cooked through, 3 to 4 minutes per side. Transfer to a plate or platter and cover loosely with foil. Repeat with the remaining oil and chicken. I served this with a little angel hair pasta and some cheesy garlic bread. What do you do with your leftover ingredients? Believe it or not, my boyfriend and I have been trying to eat a little better these days. We're going to Aruba in three weeks, so we've been going to the gym and playing a lot of Wii Fit, and we haven't been in the mood for anything super heavy when dinnertime rolls around (this has nothing to do with the cookies we consume after dinner). We've been eating a lot of salad -- specifically chicken Caesar -- and have been trying to add healthier meals into our diets. Salad can get pretty boring pretty fast, so I did some scouting around and found this recipe for chicken in a light lemon-herb sauce on Cookstr.com. The word "light" made me think it would be good for us, and I'm sure it has less calories than our usual meals. Cut each chicken-breast half in half crosswise on a diagonal, to yield two pieces of roughly equal size. Place two pieces at a time between two sheets of plastic wrap. Pound gently with the flat side of a meat mallet or the bottom of a small, heavy saucepan to flatten them slightly, to about ½ inch thick. Toss the bread crumbs, 1 tablespoon of the olive oil, 1 tablespoon of the chopped parsley, 1/ 2 teaspoon of the oregano, and salt to taste together in a bowl until blended. Spread 1 teaspoon of bread-crumb mixture over each piece of chicken, reserving the remaining crumbs. Roll each chicken piece into a compact shape with the bread crumbs running in a spiral through the center and fasten securely with a toothpick. Arrange the filled chicken breasts side by side in a 13× 9-inch, preferably flameproof baking dish. (There should be some space between the pieces of chicken.) Stir the wine, stock, lemon juice, hot pepper, the remaining 3 tablespoons olive oil, the remaining teaspoon of oregano, and salt to taste together in a small bowl. Pour into the baking dish. Whack the garlic cloves with the flat side of a knife and scatter them among the chicken pieces. Bake 10 minutes. Top the chicken with the remaining bread-crumb mixture. Return to the oven and bake until the bread-crumb topping is golden brown, about 5 minutes. If the roasting pan is flameproof, place it directly over medium-high heat, add the remaining 2 tablespoons parsley and bring the pan juices to a boil. Boil until lightly thickened, 1 to 2 minutes. (If the roasting pan is not flameproof, transfer the chicken rolls to a warm platter and pour the juices into a skillet before bringing them to a boil.) Remove the garlic cloves, or leave them in if you like. Gently transfer the chicken pieces to plates with a slotted spoon. Pull the toothpicks from the chicken without loosening the bread-crumb topping. Pour the sauce around, not over, the chicken pieces, and serve immediately. The one change I would make is to either eliminate the hot pepper or use less of it. We thought the sauce was a bit too hot, and when we ate the leftovers the next night, the heat was even more intense. Other than that, this recipe was delicious. The chicken was super moist, and topping it with bread crumbs added a little crunch but kept it from being as heavy as fully breaded chicken cutlets. Make these. You won't be disappointed -- as long as you like cinnamon and brown sugar. They satisfy any cinnamon bun cravings you might have, but because they're so much smaller, you needn't feel any guilt about eating a whole handful! Even though these cookies looked picture perfect in the February issue of Martha Stewart Living, I had no doubt that I could make them as well. I think a lot of people look at Martha's recipes and think they will be unattainable, but that's so not true. Rolling out the dough is the most difficult part, and then rolling up the filling inside requires a little patience, but that's the worst of it. Note: It helps to keep turning the log as you are slicing the cookies so you don't end up with one flat side. Then you'll want to carefully transfer the cookies to the backing sheet so the filling doesn't fall out! Watch the time carefully. My first batch came out a little crunchy. After that, I shortened the baking time because I prefer chewy cookies. I spent almost as much time looking for dessert recipes as I did dinner recipes. I knew I didn't want to make molten chocolate cakes or red velvet cupcakes, but I still wanted something that went with the Valentine's Day theme. Once I saw these heart-shaped pie dishes at Crate & Barrel, I narrowed my recipe search. I'm not very big on traditional fruit pies with lots of crust, and my boyfriend really likes chocolate pudding pie, so when I came across a chocolate pudding pie recipe with a cinnamon crust and cinnamon whipped cream, I was sold. Cinnamon definitely fits the V-Day theme in my opinion. Stir together all crust ingredients. I added 1/4 tsp cinnamon after reading a review on Gourmet's site that this pie did not have enough cinnamon. I can see that, considering cinnamon graham crackers have more cinnamon-sugar flavor than pure cinnamon flavor. Press over bottom and up side of a 9-inch pie plate. I used four small heart-shaped dishes instead. I probably could have gone with just 10 graham crackers to make enough crust for these. Bake until set, 12 to 15 minutes, then cool. Melt chocolate in a large bowl. Stir together cornstarch and 2 Tbsp brown sugar in a small bowl. Whisk together whole eggs and yolks in another bowl, then whisk in cornstarch mixture. Stir together milk, cream, salt, and remaining brown sugar in a heavy medium saucepan and bring just to a boil over medium heat. Pour half of milk mixture into egg mixture in a slow stream, whisking, then pour egg mixture into remaining milk mixture. Bring to a boil over medium-low heat, whisking constantly, then boil, whisking, 1 minute. Remove from heat and whisk in butter and vanilla. Strain through a fine-mesh sieve into melted chocolate and whisk to combine. Transfer hot filling to crust and chill, its surface covered with parchment, until filling is cold, about 3 hours. Beat cream with confectioners sugar and cinnamon using an electric mixer until it holds stiff peaks. Spoon over chilled filling. The original recipe calls for decorating with chocolate curls, but I substituted heart decorations instead (also from Crate & Barrel). Once we were ready to eat the pies, I sprinkled the hearts on top. Note: Gourmet says these pies keep up to 1 day chilled. We ate some the day I made them and the next day for breakfast and dessert, and I still had some left for breakfast the next morning. They were delicious every time. For dinner on Valentine's Day, I wanted to make something special. In my mind, the quintessential romantic meal of spaghetti and meatballs had been done... and done again. Filet mignon or another high-end cut of meat is nice, but I kind of wanted to make something new and different (for us). We had made lamb a couple of times recently, so that was out. I contemplated duck, but I didn't want to chance messing it up. I've never made duck before, and I find that duck I order at restaurants is hit or miss. 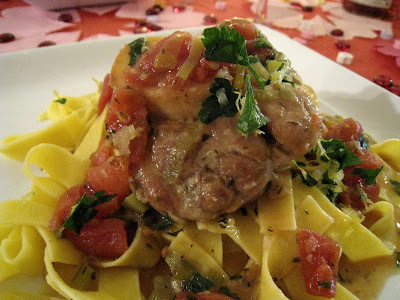 After almost a month of searching through recipes and tossing around ideas, I chose osso buco. After that, it was just a matter of finding the right osso buco recipe. There are a number of them out there, but none of the images that went with the recipes or the ingredients they included seemed like what I was looking for. I wanted a tomato-y osso buco, and many that I saw looked like they were in a brown sauce. Eventually, I turned to one of my new favorite cookbooks, Art of the Slow Cooker, and found the perfect recipe there: Osso Buco Milanese. Using a slow cooker was a good idea too because it meant I didn't have to spend the whole day cooking, but we could still enjoy an elegant meal. The next butcher was kind enough to give me some twine, so I could tie the shanks as directed in the recipe. This keeps the meat attached to the bone during the slow cooking process. ...and my boyfriend tied and knotted the rest. We dredged the shanks in some flour seasoned with salt and pepper and browned both sides in a skillet of oil warmed over medium-high heat. Then we set them in the slow cooker. I sliced leeks and celery and added these to the warm skillet and then tossed in some minced garlic and the flour that was left from dredging the veal shanks. Then I added some white bordeaux, thyme, basil, chicken broth, a bay leaf, and diced tomatoes. The mixture simmered and thickened, and then I poured it over the veal and left the slow cooker to its work. After about 5 to 6 hours on low and 1 hour on high, the veal was tender and ready to be removed from the crockpot. I scooped out the shanks and put them to the side and then added a mixture of lemon zest, minced garlic, and chopped parsley to the sauce in the crockpot. We plated the shanks over some tagliatelle and sprinkled more of the lemon mixture on top for garnish. 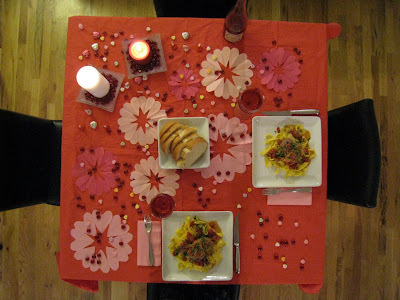 Then we sat down at our beautifully decorated Valentine's table and had a delicious dinner. The osso buco had the tomato flavor we were looking for -- though we both agreed that maybe adding tomato sauce would have given us more of the texture we wanted -- and the lemon, garlic, and parsley gave it a zingy, fresh taste. For the complete recipe, pick up a copy of Art of the Slow Cooker! I get a little silly about holidays sometimes. I like my food to fit with the theme. Maybe with Valentine's Day, it's something my mother got me into. She's made us heart-shaped french toast every Valentine's Day morning for as long as I can remember. Because I have a heart-shaped waffle maker, I thought I would make some waffles instead of french toast, and I finalized my decision after seeing a picture of these waffles in a recent Williams-Sonoma catalog. In a fry pan over medium-high heat, melt the 3 Tbs. butter. When the foaming subsides, add the apples, the 1/2 cup sugar, the cornstarch, 1/2 tsp. of the cinnamon, 1/4 tsp. of the nutmeg and 1/4 tsp. of the salt. Cook, stirring occasionally, until the apples are tender and the sugar mixture becomes syrupy, about 18 minutes. Remove the pan from the heat and stir in 2 tsp. of the vanilla. Cover the caramelized apples to keep warm until ready to serve. Preheat a waffle maker on medium-high heat according to the manufacturer's instructions. Preheat an oven to 200°F. In a large bowl, whisk together the egg yolks, buttermilk, the 8 Tbs. melted butter and the remaining 1/2 tsp. vanilla. Over a sheet of waxed paper, sift together the flour, baking powder, baking soda, the 1/3 cup sugar, and the remaining 1 tsp. cinnamon, 1/4 tsp. nutmeg and 1/2 tsp. salt. Add the flour mixture to the yolk mixture and whisk until smooth. In another bowl, using an electric mixer fitted with the whisk attachment, beat the egg whites on medium-high speed until stiff peaks form, about 1 minute. Using a rubber spatula, fold 1 cup of the whites into the batter, then carefully fold in the remaining whites. Pour about 1/3 cup batter into each well of the waffle maker and close the lid. Cook until the waffles are golden brown and crisp, 5 to 6 minutes. Transfer the waffles to a wire rack set on a baking sheet and keep warm in the oven. Repeat to cook the remaining batter. Serve the waffles hot with the caramelized apples and whipped cream. Makes twelve 4-inch square waffles. I decorated with some festive nonpareils and hearts from Crate & Barrel, and I made some chantilly cream to go on the side -- a mixture of heavy cream, vanilla, and confectioner's sugar. Note: We halved the apple mixture and had enough for the two of us plus leftovers. To make your own heart-shaped doilies, check out these instructions from Martha Stewart.